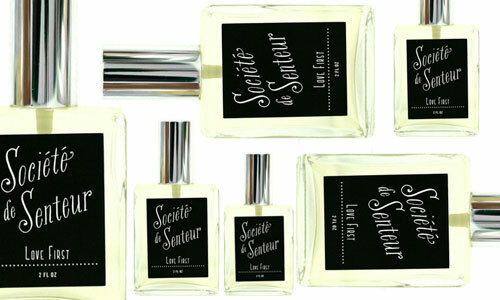 The find - a line of Eau de Toilettes called Societe de Senteur by West Third Brand. Sidenote: eau de toilette’s are slightly less concentrated than perfumes, think body mist with a little more umph. I was initially attracted to the minimalist black & white label with scripty fonts, then the names reached out and grabbed me. “Wanderful” “7 Heartbreaks” “Ropes & Sails” “Road Trip” and “Love First.” I wondered - how does Societe Senteur interpret a road trip? Each fragrance has a completely enveloping top that pulls you in and makes you want to keep smelling until you see how it turns out. The one I walked out with was Love First. You can imagine, love comes with lots of flowers so this scent is entirely floral with a little patchouli and musk. I’m normally not a real floral type of gal but this EDT smells like falling into a bed of petaly soft flowers, and then rolling around in them. I don’t know anyone who wouldn’t love that..